Hello LDV readers! Brendan here of the all new B.A.D | Blog About Design. Since much of the US is experiencing temperatures that are very cold to say the least. I've decided to take us somewhere that is a little bit warmer--at least warmer than New York. 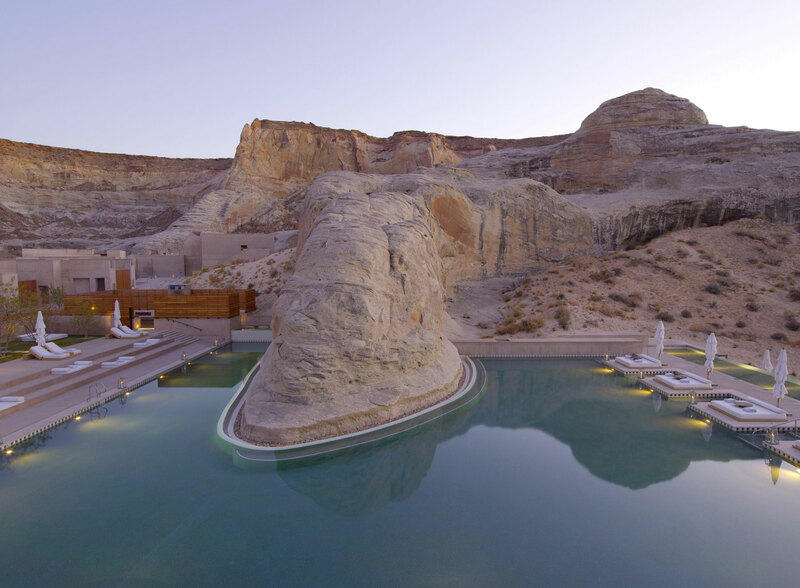 The Amangiri resort located in Canyon Point, Utah is an incredible place to visit. The hotel is all about relaxation and recharging yourself. What I find breathtaking about this resort is how it blends itself in with the landscape, when you stay here you will feel one with your surroundings. (ABOVE) A morning swim in this brilliant pool? I love how the pool is built into the boulder. (1) This image shows with great detail how the landscape and the resort work together. The resort is an extension of the natural boulders. 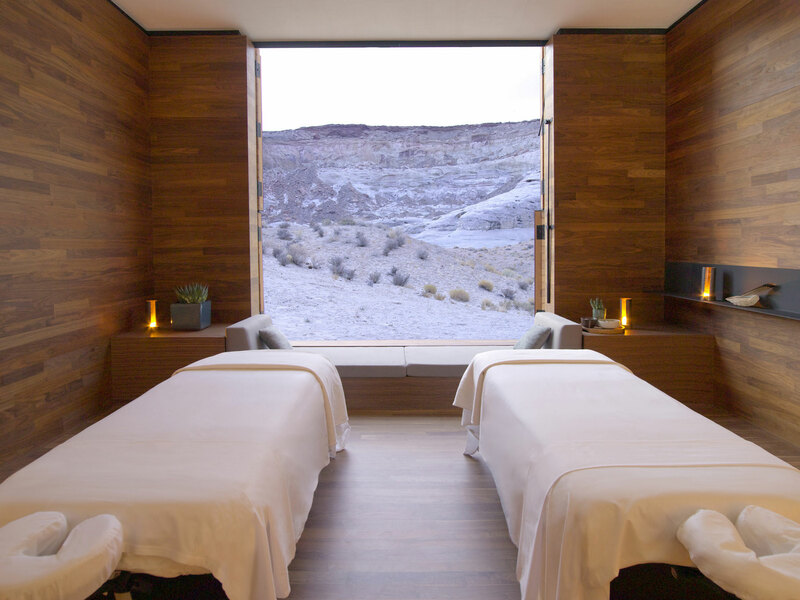 When you stay at the Amangiri you are taken out of the world. The outside lighting softens the striking architecture. (2) Off the hotel and pool is this patio. The patio is the perfect place to come to and soak in the views. The design of the patio is very fitting; clean lines and neutral colors. I could see myself coming here and laying down on one of the oversized sofas and stargaze. (3) The lobby is all about the view. Floor to ceiling windows and clean, modern furnishings evoke a sense of calmness and reflection. Having two fireplaces on either walls guarantees a front view to fire-watch. Normally when I check into a hotel I want to be given a room ASAP, but I don't think I'd mind waiting around a bit here. (4) The restaurant is adjacent the lobby and overlooks the pool. Again, the same design theme carries through. At the restaurant you can order breakfast, lunch, and dinner. The food served at the restaurant changes throughout the year, driven by locally produced seasonal foods. As much as I like the simplicity of the restaurant design, I'd like to see a red flower on each table. (5) Adjacent the main hotel is a full service spa! Come here and enjoy some unique treatments, a dry sauna, plunge pool and much more. With over 25,000 square feet of spa, you are sure to find something that suits your needs. I love the design of the message rooms. Wood paneled walls, and cream colored sheets. However, I'd like to wake up from my message and see that view, turn those beds around! (6) The suites are designed to give you a million dollar view of the mountains from your bed. I like how the desk, bed and sofa are connected, this "connection theme" is carried through in every detail. 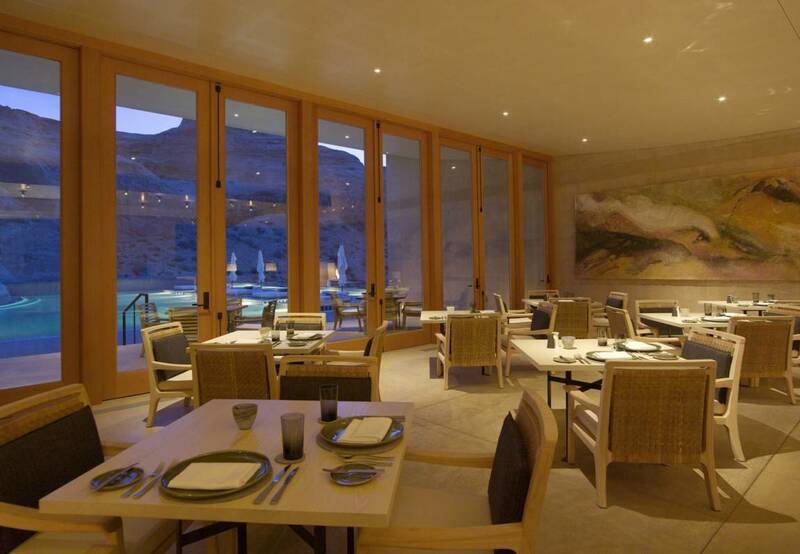 When you come to the Amangiri you can choose from a suite or a villa. A suite is your standard hotel room and you can choose a different location. A pool suite, a mesa suite, etc. A villa is a home with a few thousand square feet. What do you think of the resort? Have you stayed here? I would hop on a plane right now if I could. Stunning resort!!! Yes it is incredible visually but it is also wierd. It is quite remote and well... the staff is too. Very nice but odd. If you go you must go to Lake Powell and kayak or rent a boat for a day or overnight. It rounds out the experience perfectly.